cool. 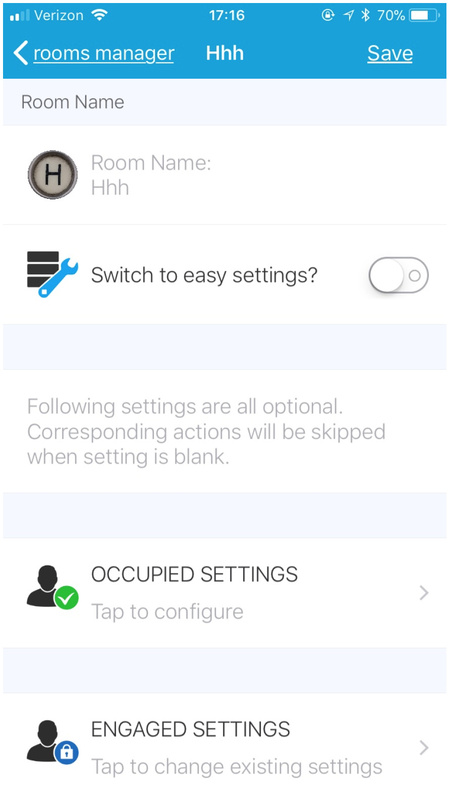 humidity is now included in the app and can be used to trigger rules. I will probably push to repo today/tomorrow. when you get the fan switch installed create another rule for the fan switch with the humidity range it should turn on at. right it counts down the number of seconds set in the timeout value in engaged settings for motion before it resets to vacant. anytime there is motion within this timeout period the countdown starts again till there is no motion within this timeout period and the room is reset to vacant. @bangali I have been away for a while and i’ve seen you did alot! Still using this every day and still working good (sometimes some hickups but haven’t researched them yet). Keep it up! hey man yeah havent seen you in a while. thats awesome! when those happen file an issue on github so we can track. i am focusing on docs (and any edge case bugs) from here. *   1) added support for icon URL setting for icon to display for each room. *   1) added icons to main settings page for room. *   1) added support for humidity sensor in rules. *   2) added contact stays open notification. *   1) added support for battery check and annoucement on low battery. *   1) added setting for annoucement volume. *   2) added support for outside door open/close announcement. thats been my experience as well. I was looking at hass for myself but a little hesitant because most users may not be comfortable with it. also playing with hubitat. they have some ways to go. but if they can deliver on the promise its likely to work for most users. *   1) refactored engaged state check to be more consistent. *   2) added fan support to temperature settings and rules. *       temperature and sets to cooling or heating mode but never turns off the thermostat. *   4) added support for named holiday light strings which can be used in automation rules. *   5) restructred the rules page a bit so not everything is on one page. *   6) added speech synthesis device for using things for annoucements. *   7) added random closing string to welcome and left home annoucements. *   1) code refactoring for hubitat compatibility. *   2) changed occupancy attribute to enum which allows for subscription to occupancy state while string dpes not. thanks @mark2k on ST community forum. *   3) added default settings for wake and sleep time for level and kelvin calculation for 'AL' settings. Anyway to get it to recognize google home relay speakers for announcement? does ST see these as speakers? not sure, but think so. then in the announcement section and see if the speaker is available to select there. *   1) change lock only to lock because hubitat does not support lock only capability. *   2) add option for cooling / heating override in minutes. *   3) added option to check room windoes before turning on cooling / heating. *   4) cleaning up text in settings as i go along. *   5) added option to not restore light level from dimming if room changes to vacant. *   6) changed how auto level works by exposing as variables everything that used to be constant in the code. *   7) added support for celsius values. *   8) refactored a bunch of code and may have squashed a bug or two in the process. *   9) refactored a bunch for hubitat compatibility. changed message separator to ‘/’ and added support for &is and &has. added save and restore sound level when playing announcements. restored lock only capability instead of using lock capability. added support for lock state contact sensor by @BamaRayne. added support for lock state switch and contact sensor to lock either on on/off or open/close by @BamaRayne. added missing dot to nightSetCT range. &is in the house! Ooo oooo/&is here./&is home./&is in the house./&is joining the party./&is crashing the party./&is gracing us with their presence./&is dropping anchor./&is dropping in./&is making the scene./&is barging in./&is showing up./&is blowing in./&is appearing./&is breezing in./&is rolling in./&is popping in. &has left the building!/&has gone out./&has popped out./&has left./&has buggered off./&has departed./&has split./&has vamoosed./&has high tailed it./&has escaped./&has eight-six’d it./&has bid farewell./&has flaked off./&has taken a hike./&has withdrawn./&has exited./&has vanished./&has disappeared./&has evacuated./&has retreated./&has taken their leave. hows that master bathroom looking these days? humidity sensor working as it should? can you remove the contact sensor requirement for presence announcement?